If you want the best burger in the city, you need to find your way to the edge of the French Quarter. 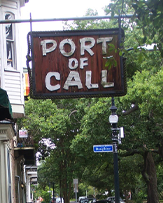 On Esplanade Avenue at Dauphine you will find the Tiki inspired decor of Port of Call. They don’t serve french fries with the burgers, so don’t ask. You get a baked potato that you can load up with all sorts of goodies and a burger cooked to your specification. I usually get the cheeseburger that comes with a huge pile of cheddar cheese. Dripping with meaty goodness (as I order mine medium rare), you quickly taste why Zagats and Gambit agree that it the best burger. Be sure you walk to the end of the bar to get seated or you can eat fast at the bar. The wait staff are very friendly and quick with service, refills and extra napkins.